For the use of a Registered Medical Practitioner, a Hospital or a Laboratory only. 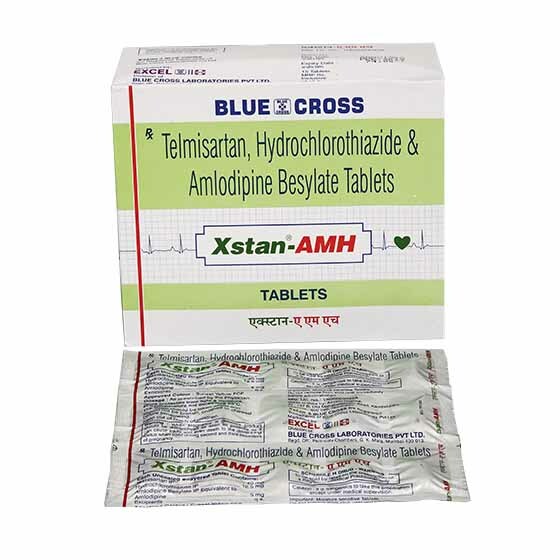 XSTAN-AMH tablets are indicated in the treatment of hypertension uncontrolled on dual drug combination therapy. Adults: Oral: The usual recommended dose is one tablet once daily. If adequate response is not achieved, dosage may be increased after at least 2-4 weeks of therapy as two tablets once daily. Or, as prescribed by the physician. Aluminium strip of 15 tablets. Registered / Corporate Office: Peninsula Chambers, Peninsula Corporate Park,G.K Marg, Lower Parel (West), Mumbai, PIN - 400013, Maharashtra, INDIA. Copyright © 2015. Blue Cross Laboratories Pvt Ltd.